Thrifting. Where else can you get cute, sometimes new, clothes on a budget? First, I'll admit that I love a good deal; second, I love fashion; and third, I love games. Thrift shopping is something that mixes all three of those things. You can shop fashionable items at a low price while trying to sift through the not so stellar items. It's a game to find the item amongst racks of other things. Yes, sometimes it takes lots of patience to "play the game of thrift shopping", but it is so rewarding. I love thrift shopping because it is a budget saver, helps the planet, and it's fun! Thrift shopping is something that I've always loved. I started when I was a kid, just trying to save a few bucks--then it revolved to a passion for second-hand shopping. I swear to you, the coolest things I have in my closet right now are from thrift shopping. Also, the most "name brand items" are also from thrift shopping. (You know your girl wouldn't spend $50 on a blouse from Bannana Republic when she could get it for $5.) I am not lying when I say I find tag-on, new, name-brand, unique items thrifting. Lastly, thrift shopping is overall good for the environment. Stereotypical fashion is expensive and not sustainable for the world or your closet. Nowadays, we tend towards over-consumption. Buying an item you'll wear only a few times gets wasteful for the environment and your wallet. Might as well donate and buy second-hand. Thrift shopping is just amazing. And did I even need to mention that people like you and me can swoop up the article of clothing for dirt cheap? Becuase it happens! Like I mentioned earlier, some of the coolest, unique, and sometimes name-brand items I have in my closet right now are from thrift shopping. I don't break the bank to stay fashionable. Now I want to share some of the items that I have found thrift shopping. I seriously love cool pants; patterned pants and weird colored pants are totally up my alley. When I saw these black and white checkered pants, I just had to try them on. Checkered pieces of clothing have definitely been "in trend" recently. I band wagoned into the trend for only $5. It only adds to the fact that they're also one of my most comfortable pants. Additionally, the pink wind-breaker is a fun pink color that is actually a soft fabric. It was only $6. This Ralph Lauren button up with pearl buttons caught my eyes on its rack. It was practically in brand new condition and it was $4. I grabbed that shirt like there was no tomorrow. The purse is a simple large Nine West bag. I was looking for something that could carry a few notebooks on an average day, and I found a fashionable option for it! The bag was only $4. 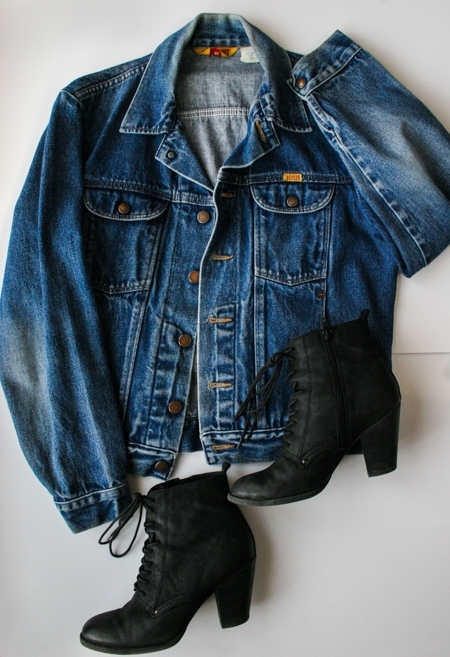 Jean jackets are so stinking cute! Real thick jean jackets can get expensive when buying them in a retail store--which is why I recommend that you buy them second-hand! I found mine that way about a year ago and I still love it. I also found these Aldo black booties for $6. I was actually thrifting with one of my friends when we found these heels. We were both in awe of how comfy they were (and the fact that the shoes fit both of us!). I already told you about finding this Nine West brown purse so now it's time to tell you about this scarf. I found a new white scarf with rainbow tassels from Target for $2 while thrifting. Tassels are also "in trend" and I am here for it. I think that the rainbow tassel scarf is so stinking cute. Who doesn't love a good pop of color? I can imagine that now you're probably wondering, "Brianna, now where did you find all of those cool items?" Well, here is my secret. The thing that you've really been waiting for: the secret about where to shop. We all know that thrift shops are not all created equally, but are you someone who has had only negative experiences? I'm sorry if you have; I know how terrible that can be. You can worry no longer. I have compiled a list of some of my favorite thrift shops for free. You will learnmy favorite locations, what each location is best for, and which ones are usually better than the other. (Also to know where I found some of the items pictured.) I want to help you step up your thrift shopping game so that you can find unique, name-brand, and inexpensive clothing items--just like I have for many years. Take advantage of the free resource I have created specifically for you by clicking here. I continue to have so much fun thrift shopping. The adrenaline of finding name-brand, stylish clothing for cheap is one of the best feelings. I hope that you can create some good thrift shopping experiences. I also want to wish you luck on your thrift shopping journey! I hope that my list of thrift shops inspires you to try some new places. Do you currently thrift shop? What are your favorite places to go for the deals? Are they similar to my favorites? Don't forget to gain access to my free resource that I created just for you!